Wismec Reuleaux RX2/3 is quite a prestigious brand in the vaping world. Due to its reliability and manufacturing of top of the line vaping products. Thus, their presence and capture of the market continue to be stable as they continue making practical and innovative devices. The new Reuleaux RX2/3 mod is a prime example. Overall, gaining the attention of sellers and vapers with its fantastic performance. The price is more than right at $45. 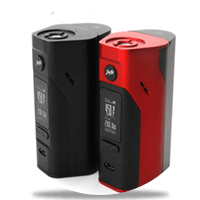 Many wonder how the Reuleaux RX2/3 is an ‘improved version.’ As such, considering most of its features are the ones that were present on the RX200S. This review is going to clear up that confusion. So, the new version gives the option of switching back and forth between batteries. Firstly, we have a dual 18650 battery chassis which has a maximum power output of 150W. Secondly, the triple 18650 battery chassis which has a total power limit of 200W. Also significant, is the difference is the design. The RX2/3 is taller and has different buttons than the predecessor. We will talk more in detail about the design in the next section. The RX2/3 is quite a beautiful mod. The construction and composition are aesthetically pleasing. So, it feels like one is holding a high-quality device. The entire presentation of the triple battery system is pleasing. Especially, with an additional option of a dual battery. Lastly, it gives it a unique feature and makes the RX2/3 unique. Not only when compared to the RX200S but other mods on the market too. Surrounding the 510 connector at the top is a tiny well which contains the juice. Also, across the top directly above the connector, it has the brand name printed. Furthermore, there are two ventilation slots, each placed on both sides of the mod. Next, the main button is on the control side, that too with the designer’s name printed on it. Additionally, the fire button is an OLED screen, an adjustment button, and a micro-USB port. Design wise, the back of the mod is going to change its appearance. That is, though depending on the battery system you choose. Like, the 2-battery setup with a flat cover or the three battery setup with a regular Reuleaux back cover. There are four air ventilation slots at the bottom. Also, there is a tiny square button, which is for detaching the battery cover. The Wismec Reuleaux RX2/3 not only comes with the exact features and functions that vapers love about the older model. But they have also integrated it into a versatile and strong device. The features of the Wismec Reuleaux RX2/3 are quite impressive. Firstly, not only will you get the same functions and features that you’ve come to love about Reuleaux products. Thus, integrated into a strong, versatile device that is ideal for daily use. Once again, the key feature which differs from the RX200s is the dual battery setup options. Unfortunately, there are trade-offs. You will have to consider these depending on what is more important to you for vaping. One battery setup ensures maximum battery life and power. Sadly, this may compromise on the vape slightly. Interestingly, the second system will reduce the battery power used and make the device more portable. Overall, enhancing the vaping experience and make it longer. A trait which long term Reuleaux vapers love is that the same features are also on the entire Reuleaux series line. Some of the features are temperature control settings can be between 200 and 60 degrees. Therefore, is compatible with stainless steel and titanium builds. A TCR mode is also present, and the power can be lowered down to the lowest figure of 0.05 ohms in temperature control. Wismec suggests using an external charger for charging batteries. Though, you can also do it using the micro-USB port. Which, is also used for upgrading the firmware whenever a new version is out. It is hard to believe that any product can be so flawless. We wish we had something negative to say about the Wismec Reuleaux RX2/3. Though, there are no complaints at all whatsoever about the performance. The performance and vaping experience are phenomenal. Overall, it blows even some of the higher end brands out of the water. The vaping is consistent and smooth. Also, we love the fact that the performance is like that offered by a DNA chipset! If you aren’t familiar with the DNA chipset, it is perhaps the most sought-after technology. Surprisingly, the RX2/3 offers a similar experience at a comparatively inexpensive price. The Reuleaux RX2/3 by Wismec is essentially an extremely versatile mod. The products by the company have become some of my preferred favorites. Because of their unmatched performance and out of the box designs. You will not be able to find a better executed two and three battery configurations elsewhere. At least for a justified price, the mod gives exceptional high-power wattage too. The RX2/3 has our seal of approval and our recommendation for both newbies and experts.